Many women experience stiffness and pain in their joints at some point during their lives. 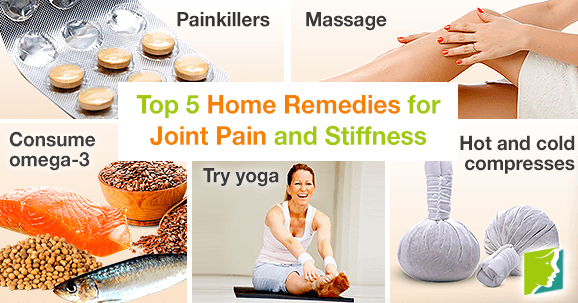 Fortunately, there are things that can be done to ease joint pain and stiffness in the comfort of your own home. Joint pain and stiffness is often a sign of arthritis, so it is important to see a doctor in order to receive an accurate diagnosis and treatment, but home remedies can soothe the symptom in the meantime. While it is important to talk to your doctor about whether anti-inflammatory medicine and other medicine used to treat arthritis is right for you and can help treat your joint pain, there are also nonprescription medicines available. Many people used over-the-counter painkillers to treat joint pain. Massages are a great way to pinpoint and remedy the specific joint that is causing you pain. Massaging your joints will improve circulation, relax muscles, and ease inflammation, three important elements in alleviating joint pain and stiffness. A lotion or diluted essential oil with a pleasant scent can be used to promote relaxation as well. Eating more foods rich in omega-3 fatty acids - such as salmon, flaxseed, and soy - may help alleviate joint pain. It is also important to get enough calcium, vitamin D, and vitamin E.
Though exercise can feel like the last thing in the world you want to do when you are suffering from painful and stiff joints, low-impact exercises can work to remedy the ailment. Taking up yoga with a home DVD as your sport of choice can help you to get regular exercise, which is a great habit for those looking to boost their overall health as well as the health of their joints. However, try not to do anything too high impact, as this can worsen joint pain. One of the most effective ways to gain relief from joint pain and stiffness through using compresses is to alternate between hot and cold. Apply a cold compress directly to your painful joint for 15 minutes before switching to a hot compress for eight more minutes. Doing this three times in a row each day can help you notice immediate easing of pain. Suffering from painful and stiff joints during the menopause transition can be frustrating. If your joint pain is chronic or reoccurring, it is important to seek the advice of your doctor. Click on the following link to learn about treating joint pain.